Choose polygon from geometry cabinet. Center on white card stock leaving room to write name below. Take pencil and mark the vertices. Use pin puncher and felt pad to pun a hole through each vertex. Measure embroidery floss needed by placing it around the perimeter of the polygon. Then double it. Thread the embroidery floss through the needle and make a knot at the end. Start on the backside of the card stock and pull needle through. Continue to sew. You will see the polygon shape start to form as you sew from one vertex to the next. You will need to sew around the whole polygon twice to see the polygon emerge. Unthread the needle and tie a knot on the back by splitting the six strands of embroidery floss into two groups. Tie like you tie a knot with your shoelaces. If you would like to add the name of the polygon that can be done now using pencil. (See variations listed below). Apply photo splits to each corner and one in the middle. Attach to colored card stock. Add a 3″ piece of craft ribbon to the top by taping on the back. Now you can hang up your masterpiece. Differentiation: To meet students of varying ability levels, I made several variations which you see in the picture. Sew the polygon and write the name below in pencil. Sew the polygon. Write the name in pencil. Add dots to the name and pin punch. Sew the name of the polygon. (Remember you will have to sew around the whole name twice). Rotate the polygon to make an interesting pattern. In the photo above I started with the hexagon and use three different colored pencils to represent the three colors of embroidery floss I planned to use. I marked the vertices of the hexagon first in green. Then I rotated the hexagon and marked the vertices in blue. I rotated the hexagon a third time and marked the vertices in purple. Then I threaded my needle with green embroidery floss and sewed the green vertices. Next, the blue and finally the purple. It makes a very pleasing design. Create all the polygons from the geometry cabinet and attach to one ribbon as a garland of polygons. 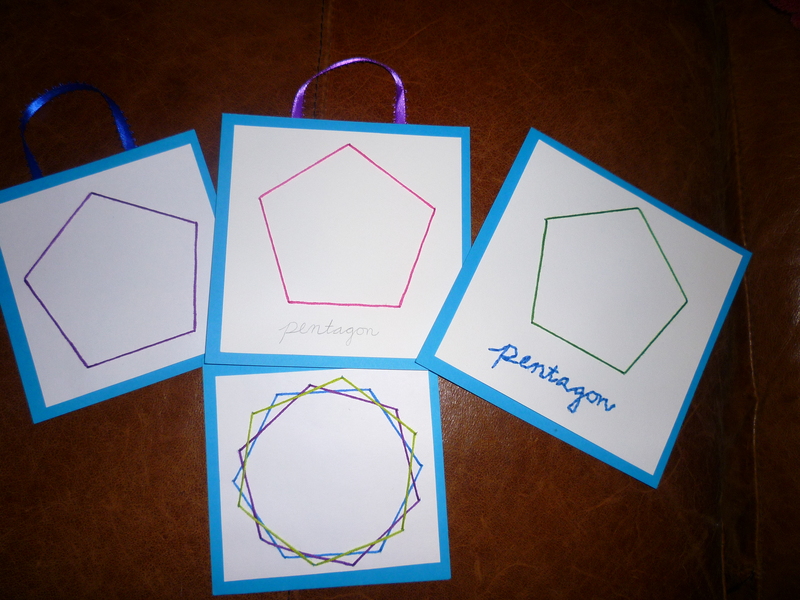 Create all the polygons from the geometry cabinet and bind your pages together to create a hand sewn book of polygons. Direct Aim: Identify and remember the names and shapes of polygons. Indirect Aim: Develop concentration and coordination of movement. Appreciate the beauty of geometry. I think you will find your students will be excited to do this work! By synevabarrett in Uncategorized on October 21, 2013 .